Summer is flying by far too quickly, but the good news is that August means it's time for Summer Under the Stars on Turner Classic Movies! 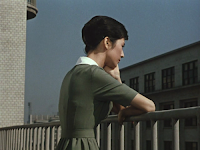 As usual, TCM has prepared a fun Summer Under the Stars microsite. The August schedule is also available in a nice printable PDF format. For a quick overview of the stars being celebrated on TCM this month, please check out the complete list of names I posted in May. ...The month starts off with Humphrey Bogart Day on Thursday, August 1st. There are lots of great films on tap, including three he made with Lauren Bacall. I recently saw the widely admired IN A LONELY PLACE (1950) and confess to having been somewhat underwhelmed. It's an interesting film, though, and I encourage those who've not yet seen it to check it out. 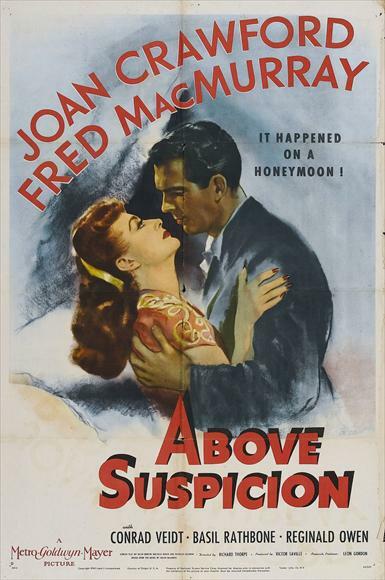 I especially appreciated the movie for its supporting actors, Frank Lovejoy and Jeff Donnell, as the "average" couple opposite Bogart and Gloria Grahame. ...I love Doris Day, and I believe I've seen all but three of her films which are showing on August 2nd. (I'd better get to work seeing the rest!) 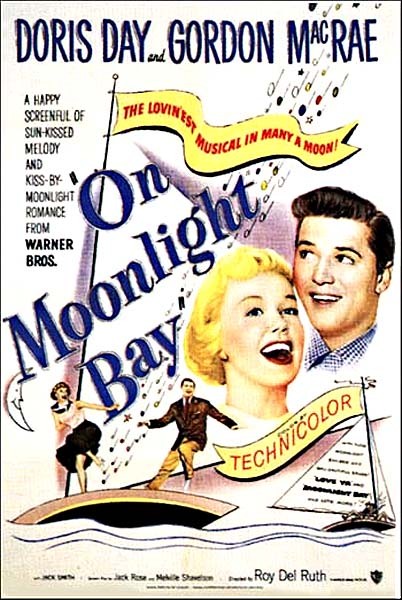 I especially recommend ON MOONLIGHT BAY (1951) and its sequel, BY THE LIGHT OF THE SILVERY MOON (1953), which both costar Gordon MacRae. They're delightful family stories with Leon Ames and Rosemary DeCamp as Day's parents, Billy Gray as her little brother, and Mary Wickes as the maid. 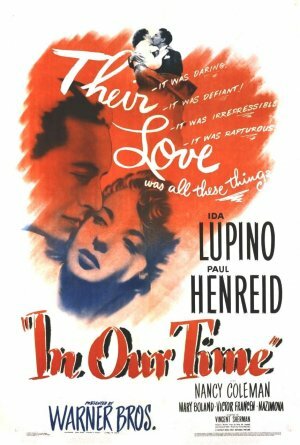 ...I thoroughly enjoyed IN OUR TIME (1944), a WWII film starring Paul Henreid and Ida Lupino, when I saw it in early July. It airs on TCM on August 4th, Mary Boland Day. Boland plays Lupino's obnoxious yet sympathetic employer in the first part of the film. ...On Charlton Heston Day, August 5th, I'm interested in checking out DIAMOND HEAD (1963), costarring Yvette Mimieux, George Chakiris, and France Nuyen. Those four actors on location in beautiful Hawaii should be fun to look at, if nothing else! ...Tuesday, August 6th, is Joan Fontaine Day. 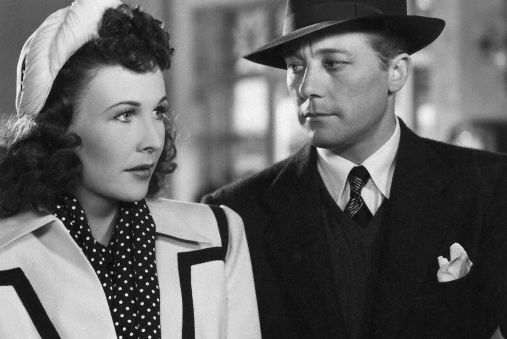 I'm looking forward to seeing an early Fontaine film I've not previously come across, MUSIC FOR MADAME (1937). 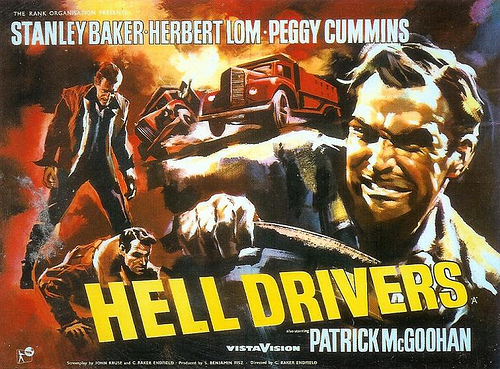 The entire lineup is simply terrific, including her film with Fred Astaire, A DAMSEL IN DISTRESS (1937); Nicholas Ray's immensely entertaining BORN TO BE BAD (1950), costarring Robert Ryan, Joan Leslie, Zachary Scott, and Mel Ferrer; the evergreen Hitchcock films SUSPICION (1941) and REBECCA (1940); LETTER FROM AN UNKNOWN WOMAN (1948), which is on my list of 10 Classics to see for the first time this year; and THE CONSTANT NYMPH (1943), with one of Fontaine's greatest performances. ...I also love Fred MacMurray Day on August 7th! There are lots of entertaining titles on the day's agenda. I've previously reviewed a number of the films being shown, including TOO MANY HUSBANDS (1940), ABOVE SUSPICION (1943), NEVER A DULL MOMENT (1940), A MILLIONAIRE FOR CHRISTY (1951), DOUBLE INDEMNITY (1944), and PUSHOVER (1954). If you've seen DOUBLE INDEMNITY a million times, give PUSHOVER a try -- it's very interesting watching Fred fall for a femme fatale in a film made a decade later. ...THE HONEYMOON MACHINE (1961) is a cute comedy airing on Steve McQueen Day, August 9th. It costars Jim Hutton and Paula Prentiss. I got a kick out of this one. ...It's fun seeing the very young Lana Turner in RICH MAN, POOR GIRL (1938), airing on August 10th. 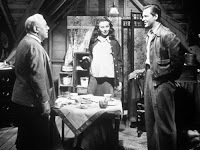 Robert Young and Ruth Hussey play the title characters. Lots of other good movies air that day, including THE BAD AND THE BEAUTIFUL (1952). ...There are many good movies on Mickey Rooney Day, August 13th, but if I were to recommend just one it's THE HUMAN COMEDY (1943), MGM WWII Americana at its finest. The cast: James Craig, Marsha Hunt, Frank Morgan, Fay Bainter, Van Johnson, Donna Reed, Jackie "Butch" Jenkins, Dorothy Morris, Ray Collins, Henry O'Neill, and Katharine Alexander. They don't come any better than this one. Directed by Clarence Brown. ...It's Bette Davis Day on April 14th. Some Davis titles airing that day which I've just seen within the past year or so: DARK VICTORY (1939), WATCH ON THE RHINE (1943), and PAYMENT ON DEMAND (1951). All are worth seeing, especially DARK VICTORY. ...The highlight of Gregory Peck Day on August 15th is a rarely seen TCM premiere, THE MACOMBER AFFAIR (1947). Joan Bennett and Robert Preston also star in this compelling Hemingway tale. Take advantage of the chance to see this film at long last. ...One of my favorite days on the schedule is August 16th, Ann Blyth Day. Beautiful Ann will turn 85 on that date, and I send her my happiest birthday wishes! 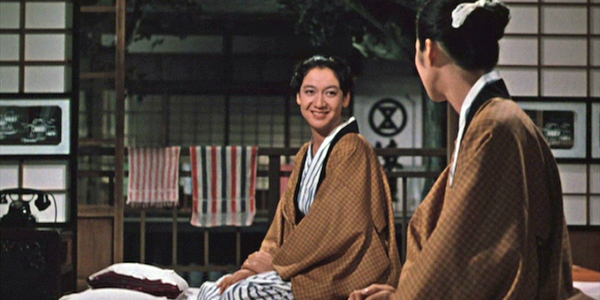 I had the chance to see Ann at KISMET (1955) at this year's TCM Classic Film Festival; both Ann and the movie were a treat. I also got to see her at a screening of MILDRED PIERCE (1945). The entire schedule looks good; I've got a soft spot for ALL THE BROTHERS WERE VALIANT (1955), a seafaring tale costarring Robert Taylor and Stewart Granger, plus a terrific Rozsa score, and OUR VERY OWN (1950), an adoption tale with Farley Granger which was on TV a lot when I was a kid. ...I'll never understand the appeal of Wallace Beery, but he certainly worked with a lot of good costars. He was in one of my favorite early Jane Powell movies, A DATE WITH JUDY (1948), which airs on his day on August 17th. 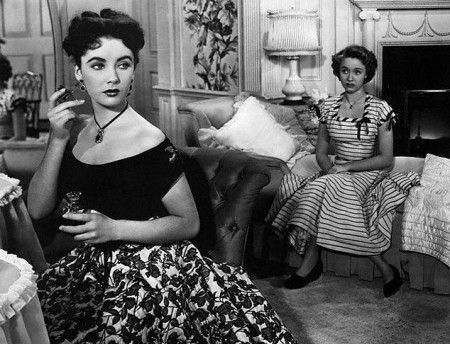 The young Elizabeth Taylor's in it too, and she's a knockout. Plus Carmen Miranda and Cugie! I love the finale, "It's a Most Unusual Day." ...One of the interesting films airing on Natalie Wood Day, August 18th, is A CRY IN THE NIGHT (1956), a crime film costarring Brian Donlevy, Edmond O'Brien, Raymond Burr, and Richard Anderson. 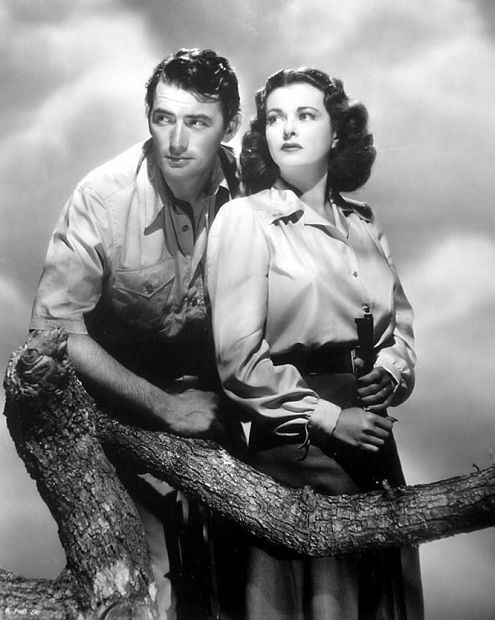 It was produced by Alan Ladd's Jaguar Productions, and Ladd is the film's opening narrator. It's by no means a perfect film, but I found it quite watchable and interesting. It's not on DVD or VHS so this is a great chance to catch it. ...Randolph Scott Day, August 19th, would be a great day to call in sick. Along with fantastic must-see Westerns such as RIDE LONESOME (1959) and COMANCHE STATION (1960), you can see him in a really fun comedy, MY FAVORITE WIFE (1940), costarring Cary Grant, Irene Dunne, and Gail Patrick. ...The lineup on Hattie McDaniel Day, August 20th, includes IN THIS OUR LIFE (1942), a wonderful melodrama starring Bette Davis, Olivia de Havilland, George Brent, and Dennis Morgan. 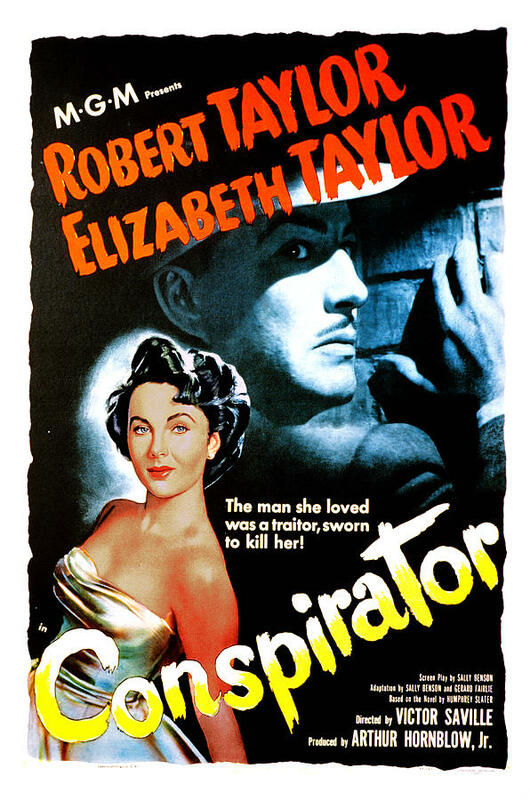 ...Elizabeth Taylor day, August 23rd, includes CONSPIRATOR (1949), a thriller in which she starred opposite Robert Taylor -- who plays a villain! That's one I've been wanting to check out. ...Charles Coburn Day is another day I could happily watch nonstop. And it's a Saturday, too! Among the many good movies airing on the 24th: VIVACIOUS LADY (1938), H.M. PULHAM, ESQ. (1941), PRINCESS O'ROURKE (1943), TOGETHER AGAIN (1944), BACHELOR MOTHER (1939), LURED (1947), THE MORE THE MERRIER (1943), HEAVEN CAN WAIT (1942), and even more! A truly fantastic day. ...I could watch all day on Sunday, August 25th, too -- Clark Gable Day! I've seen a majority of the films airing that day. I really appreciated revisiting IT HAPPENED ONE NIGHT (1934) at the TCM Classic Film Festival and highly recommend giving it a fresh look. ...My favorite Summer Under the Stars day this year is August 26th -- Jeanne Crain Day! I'm looking forward to catching two of the relatively few Crain films I haven't seen, GUNS OF THE TIMBERLAND (1960) with Alan Lady and THE MODEL AND THE MARRIAGE BROKER (1951) with Scott Brady. Jeanne Crain films airing on this date which I've previously reviewed: THE FASTEST GUN ALIVE (1956) with Glenn Ford, MARGIE (1946), YOU WERE MEANT FOR ME (1948), APARTMENT FOR PEGGY (1948), DANGEROUS CROSSING (1953), TAKE CARE OF MY LITTLE GIRL (1951), and SKYJACKED (1972). As is probably apparently from that list, Crain is one of my favorite actresses! I highly recommend MARGIE and APARTMENT FOR PEGGY. 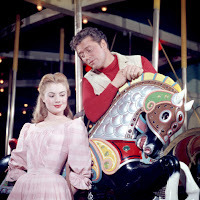 ...On Shirley Jones Day, August 28th, I particularly recommend CAROUSEL (1956) -- especially for those folks not fortunate enough to see Jones in person at a screening of the film at the Aero in Santa Monica this Friday night. ...Glenda Farrell Day is another of my favorite days, on August 29th. I'm especially looking forward to seeing a couple more of the films she made with Joan Blondell, I'VE GOT YOUR NUMBER (1934) and KANSAS CITY PRINCESS (1934), plus SNOWED UNDER (1936) with George Brent. ...In the past year or so I've very much enjoyed Peggy Cummins in GUN CRAZY (1950) and HELL DRIVERS (1957), so I'm looking forward to seeing her in ESCAPE (1948). It will be shown as part of Rex Harrison Day on August 31st. For more on the August schedule, Cliff has a wonderfully detailed post with his personal top picks at Immortal Ephemera. 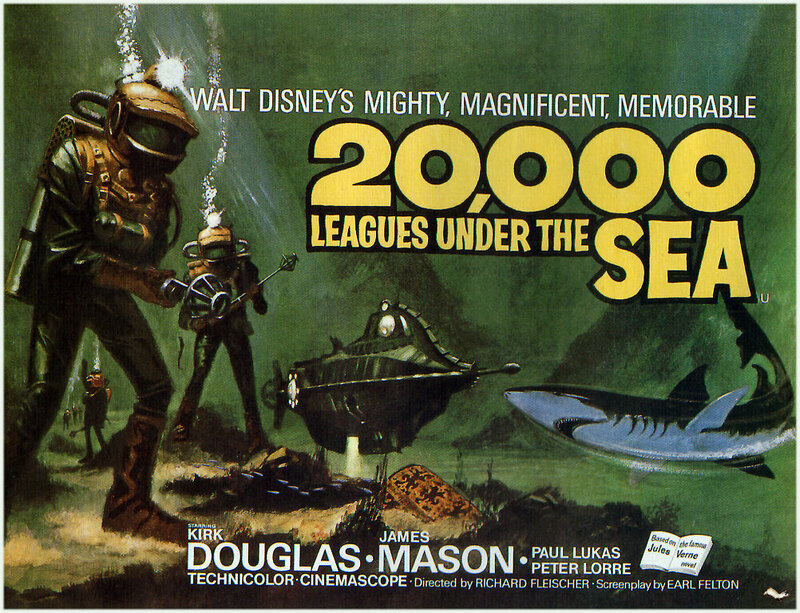 When I put together this year's list of 10 Classics to see for the first time in 2013, I decided to include a Disney film and chose 20,000 LEAGUES UNDER THE SEA (1954). I was really fortunate that the movie was screened today at the Egyptian Theatre so I could see it for the very first time on a big screen! This is the fourth film seen this year from my list of ten movies. Our evening started across the street with dinner at Miceli's, which opened in 1949 and was seen in the film NIGHTFALL (1957). Robby wrote about the restaurant last May at Dear Old Hollywood. I really enjoyed the restaurant's spaghetti with meat sauce and would happily dine there again. (They do need to work on the bland dinner rolls.) Miceli's had great service and atmosphere, and it was especially fun to eat there after seeing NIGHTFALL just a few weeks ago. The 20,000 LEAGUES UNDER THE SEA screening was part of a tribute to the film's production designer, Harper Goff, by the Art Directors Guild Film Society. Goff's fascinating career included designing attractions such as Disneyland's Jungle Cruise and Golden Horseshoe, as well as the World Showcase at Epcot. Goff was also a banjo player in Disney's Firehouse Five Plus Two group and can be seen playing the banjo on screen in PETE KELLY'S BLUES (1955), another film on which he served as production designer. 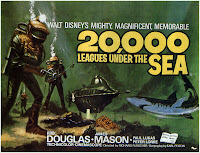 Goff's design work on 20,000 LEAGUES included the design of the Nautilus submarine, which he first showed Walt Disney as a carving he created over a weekend. At the time the film came out, union politics were such that Goff ended up with a film credit saying "Production Developed By..." The Art Directors Guild has formally announced that they are correcting the historical record and acknowledging that Goff was the film's production designer. An impressive array of talent gathered at the Egyptian to discuss Goff's work after the movie: Disneyland Imagineering Legends Marty Sklar and Tony Baxter, matte artist Harrison Ellenshaw (son of the great Disney artist Peter Ellenshaw), and Stephen Berger, who worked with Goff on FANTASTIC VOYAGE (1966). One of the stories I enjoyed the most was hearing how Goff led the bulldozers and showed them where he wanted them to dig the Jungle Cruise river. No maps or other paperwork -- Sklar and Baxter said Goff saved the company an enormous amount of money simply because he had the talent to know what he wanted and call the shots for the track layout on the spot. They also said it was his concept sketch of the World Showcase which did more than anything to sell Epcot to higher-ups at Disney. As a fun side note, I also noticed John and Deborah Landis were among the attendees. My husband and I enjoyed the chance to say hello to our friend Deb of Sidewalk Crossings, who was also there tonight; 20,000 LEAGUES is her favorite movie! As for the movie itself, I enjoyed catching up with it at long last. I can't really say it's the kind of movie I like best, and indeed, it ends on rather an emphatic downer note; it's also quite long, at 127 minutes. Even with that length, some of the cast were left adrift at sea in a small boat when "The End" came on the screen -- can we assume they were later saved?! The things I appreciated most were James Mason, always an interesting actor, as Captain Nemo, and Goff's production design, which was truly stunning. There were several times as the Nautilus criss-crossed the screen that I simply thought "Wow!" It was truly an impressive-looking film. I guess I could summarize my reaction as saying the film didn't deeply engage or move me, but it held my attention and I especially enjoyed simply looking at it. Having the chance to learn more about the movie in tonight's setting made it a much richer, deeper viewing experience which I very much appreciated. As Disney fans are already aware, the film also stars Kirk Douglas, Paul Lukas, and Peter Lorre, with Robert J. Wilke and Ted de Corsia in major supporting roles. The movie was directed by Richard Fleischer (THE NARROW MARGIN) and filmed by Franz Planer. The 2-Disc DVD has plentiful extras, including a commentary track with Rudy Behlmer and director Richard Fleischer. We have the DVD on our Disney shelf so I'll definitely be checking out the extras in the days to come. The DVD can be rented from Netflix and ClassicFlix. It also had a VHS release and can be rented for streaming from Amazon. Related post: I shared photographs of the Nautilus attraction at Disneyland Paris here. 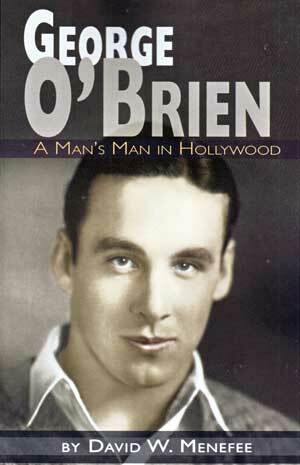 ...Given how much I've been enjoying George O'Brien movies this year, including last night's UCLA screening of the spectacular NOAH'S ARK (1928), when I came across this book it jumped right to the top of my wish list: GEORGE O'BRIEN: A MAN'S MAN IN HOLLYWOOD by David W. Menefee. It's from Bear Manor Media. Here's a review. ...While we're on the subject of George O'Brien, here's a neat site dedicated to the actor, and here's an interesting post at Strictly Vintage Hollywood with a photograph of O'Brien's childhood home in San Francisco. ...As I mentioned some time back, the ClassicFlix DVD rental site is redesigning its website, and I'll have articles and reviews appearing there from time to time. The Beta version of the site is now live. It's a really good-looking redesign! After a testing phase for the next month or so, the new version of the site will become the permanent look of ClassicFlix on the web. Articles by various writers can be found in the Community section; initial posts include my tribute to Tyrone Power, an Introduction to Pre-Code Cinema by Stacia of She Blogged By Night, and a guide to some of the best '50s Westerns by Toby of 50 Westerns From the 50s. ...Frank Lovejoy is an actor I've really come to appreciate over the past couple of years, in a host of different titles. Olive Films, which recently released his movie RETREAT, HELL! (19520, has two more of his movies coming out on September 24th: SHACK OUT ON 101 (1955) and THE AMERICANO (1955). 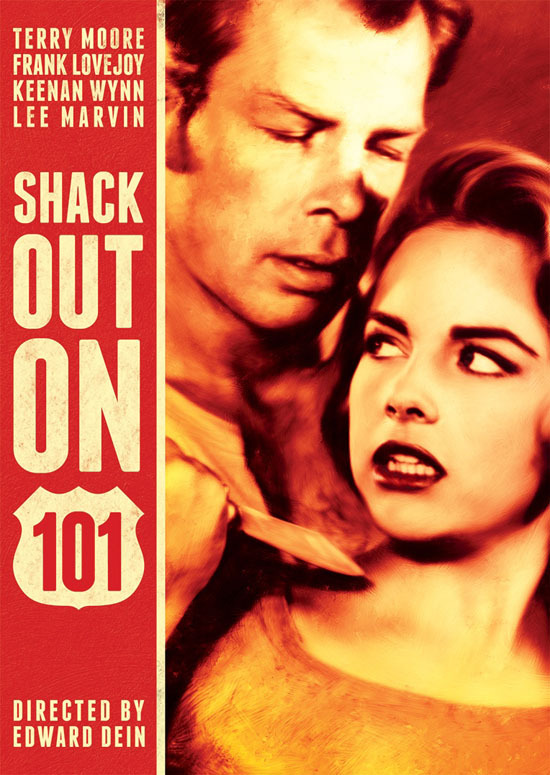 SHACK OUT ON 101 costars Terry Moore, Lee Marvin, and Keenan Wynn, while THE AMERICANO also stars Glenn Ford, Cesar Romero, and Ursula Thiess (Mrs. Robert Taylor). ...John Williams has confirmed he will score STAR WARS EPISODE 7, along with EPISODES 8 and 9. Whew! ...From the "What on Earth is This?" 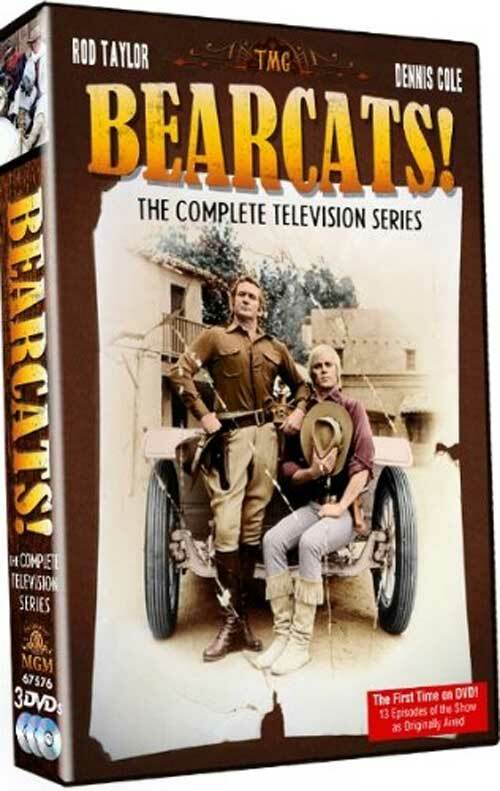 Department: Now out on DVD, BEARCATS!, a shortlived 1971 TV series starring Rod Taylor. ...Announced for the Third TCM Classic Film Cruise: Jane Powell, Robert Wagner, and Theodore Bikel, as well as the Alloy Orchestra. ...Earlier this month I shared my Summer Reading List. I hope to have my third review of the summer up in a few days' time! Last week at Out of the Past Raquel shared links to numerous book reviews by participants in her Summer Reading Classic Film Book Challenge. 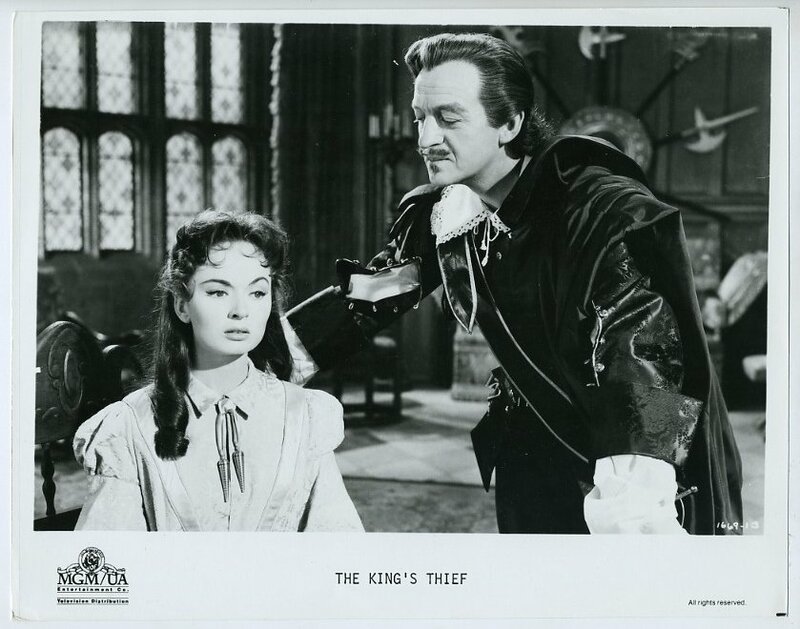 ...As an Ann Blyth fan, I want to see THE KING'S THIEF (1955), now available in a remastered print from the Warner Archive. There are some gorgeous photos up from it at Greenbriar Picture Shows. ...Paul Henreid's daughter, Monika, has a Facebook page for a planned memoir of her father, with many nice photos. ...Lindsay just caught up with the Criterion release of MINISTRY OF FEAR (1944) and wrote about it at Lindsay's Movie Musings. This is one I'm looking forward to revisiting soon. ...Lou Lumenick is back from a summer break with lots of DVD announcements. ...Notable Passing: Cop-turned-actor Dennis Farina has passed on at the age of 69. His credits included OUT OF SIGHT (1998) and BOTTLE SHOCK (2008). ...Attention Southern Californians: On Friday, August 2nd, Shirley Jones will appear in person at a 35mm screening of CAROUSEL (1956) at the Aero Theatre in Santa Monica. 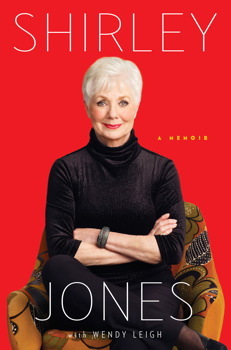 Prior to the screening she'll be signing her brand-new book, SHIRLEY JONES: A MEMOIR. 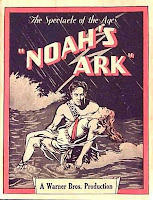 Tonight was a fascinating viewing experience, seeing the part-silent, part-talkie NOAH'S ARK (1928) at UCLA. The 100-minute release version restored by UCLA was shown in 35mm as part of the ongoing Archive Treasures series. NOAH'S ARK was one of the earliest American films directed by Michael Curtiz, and the film was introduced tonight by historian Alan K. Rode. Rode's forthcoming biography, MICHAEL CURTIZ: A MAN FOR ALL MOVIES, is expected to be published by the University Press of Kentucky approximately one year from now. Rode said that Curtiz's refusal to use miniatures for the flood sequence led to cameraman Hal Mohr leaving the production; Mohr shares credit with Barney McGill. The flood sequence is quite astonishing in its realism and brutality, as Curtiz had many thousands of gallons of water dumped on extras who were very realistically fighting for their lives. Leading lady Dolores Costello contracted pneumonia during the filming of this sequence, while George O'Brien lost his big toenails. Many extras were injured during the flood sequence, and Rode mentioned that it's a Hollywood legend that some extras were killed and Warner Bros. covered it up. He said that to date he's been unable to find any evidence that this was true; however, as he said, one has no trouble believing it when watching the movie! It's been rumored, incidentally, that John Wayne and Andy Devine were among the flood extras. NOAH'S ARK has additional historical interest as it's from the "transition era" of silents to sound. It's a spectacle which was three years in the making, and THE JAZZ SINGER (1927) came out partway through the film's production. 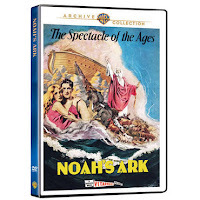 NOAH'S ARK begins with a musical overture and has a complete Vitaphone musical soundtrack composed and conducted by Louis Silvers, as well as some special effects sounds. The film also has talking scenes; Noah Beery (Sr.), who plays the villain, has a voice which is impressively deep and scary. 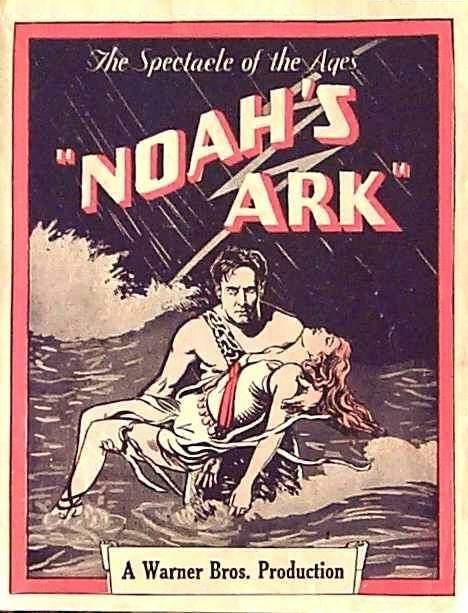 Despite being partially a talkie, NOAH'S ARK has an incredible number of narrative cards, far more than the Harold Lloyd movies I've seen this year. Viewers could be forgiven for thinking at times they were reading a movie rather than watching one! 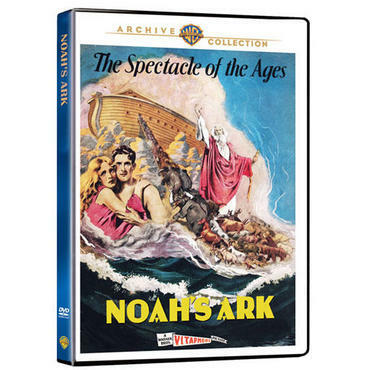 NOAH'S ARK has a dual storyline, created by one Darryl Francis Zanuck. For most of the film it's a WWI saga telling of the star-crossed love of American Travis (O'Brien) and German Marie (Costello) as the war rages across Europe. It's pure melodrama, complete with a villain (Beery) who does everything but twirl a mustache as he threatens our heroine -- honestly, he might have done that too! The unbelievable climax of this part of the movie will not be shared here, but the film then segues into what might be called a dream sequence, with a lengthy telling of the story of Noah's Ark. In this section of the film, O'Brien is one of Noah's strapping sons, while Costello is his betrothed. 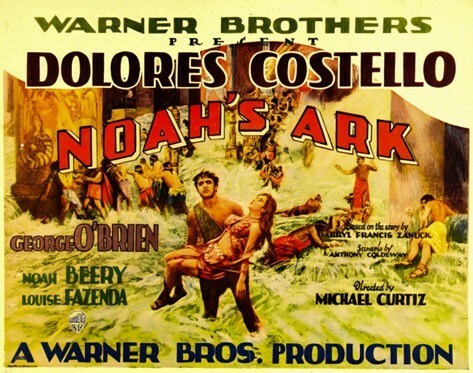 The film departs from the Old Testament record with a story in which Costello is kidnapped by an evil king (Beery again) to be sacrificed to a pagan god; O'Brien is off to try and save her while his father and brothers build the ark. The movie is quite disturbingly brutal at times, as O'Brien and Costello suffer various forms of torture before the rain starts falling. To watch this section of the film is to marvel at the sheer audacity of the filmmakers. It rivals and perhaps tops the films I've seen to date by Cecil B. DeMille. The viewer is simultaneously caught up in the story and very aware that in real life hundreds of extras were having untold amounts of water dumped on them; according to Rode, Curtiz was even seen hurling two-by-fours towards some of the extras for added realism! And it occurs to me I haven't even yet mentioned the train crash sequence near the opening of the film...in that case some miniature work was created to good effect. 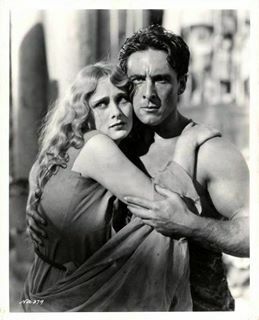 O'Brien was in his mid-20s when production began, and he's quite impressively hunky, particularly in the Ark sequence, when he carries Costello for extended periods of time. He's a charmer, as always. 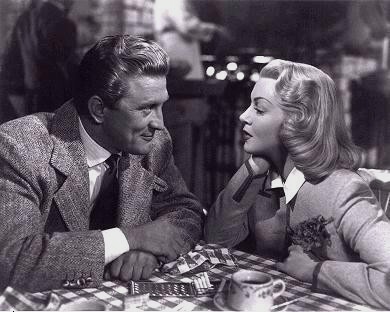 Costello -- Drew Barrymore's grandmother -- has angelic features which were well-suited to her role, as she spends much of the film with her eyes cast upward in prayer. Having only seen her previously in THE MAGNIFICENT AMBERSONS (1942), I enjoyed seeing her in an earlier role. The cast includes Myrna Loy in a small but noticeable speaking role as a dancer and Guinn "Big Boy" Williams -- billed as Gwynn Williams -- as O'Brien's best friend. Williams turns up again in the Ark sequence as O'Brien's brother. This movie is available on DVD via the Warner Archive. 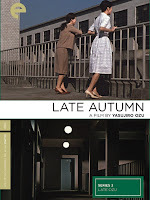 It was reviewed by Glenn Erickson at DVD Savant in 2011. It's also been shown on Turner Classic Movies. TCM has a reissue trailer available on the TCM website. Four years after costarring in the road trip romance LOVE ON A BET (1936), Gene Raymond and Wendy Barrie teamed for another story of love on the run, CROSS-COUNTRY ROMANCE (1940). I think I might have liked CROSS-COUNTRY ROMANCE even better than the fun earlier film. 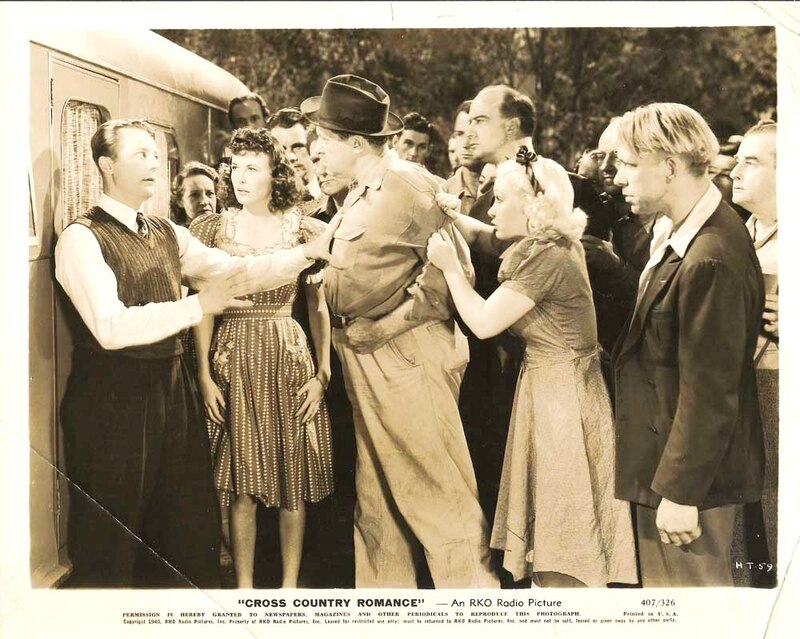 CROSS-COUNTRY ROMANCE follows the tried and true formula from IT HAPPENED ONE NIGHT (1934) and other movies of its type, with wealthy Diane North (Barrie) skipping out on her wedding to boring Walter (George P. Huntley). 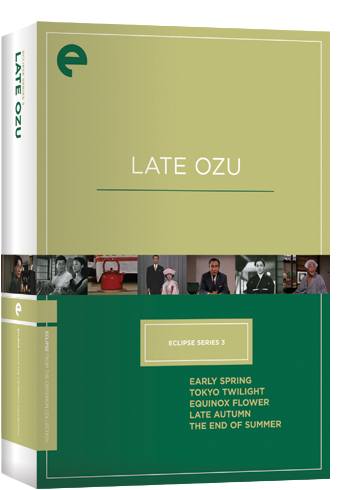 Clad only in a slip, Diane hops into a travel trailer parked outside her mother's New York apartment, which is then driven off by Dr. Larry Smith (Raymond). Larry is heading cross-country to San Francisco, as he plans to board a ship for China where he will work with a famous doctor on a cure for leukemia. Needless to say, Larry's a bit surprised to find a stowaway in his trailer, and when he refuses to believe his unexpected guest is the famous Diane North, Diane gives up and tells Larry her name is Maggie Jones. No one will be surprised that as Larry and Diane/Maggie travel across the United States, they fall in love. This is a fast-moving 68-minute film filled with trailer parks, diners, and small-town cops. Sure, the movie's very derivative, and there would be similar films which followed it -- that's actually part of its charm. Sometimes a romantic road trip comedy is exactly what a viewer wants. There are lots of fun faces scattered throughout the movie. Cliff Clark (Inspector Donovan from the later FALCON movies) plays an Omaha police chief who has one of the best moments, demonstrating his department's efficiency, and Hedda Hopper does a fine job as Diane's ditzy mother. Billy Gilbert, Frank Sully, Tom Dugan, Dorothea Kent, Dorothy Adams, Herb Vigran, and Esther Dale all pop up. It's great fun to spot Hank Worden as the witness to Larry and Maggie's wedding, or Bess Flowers as Mrs. North's secretary. The best actor sighting of all is saved for the end of the movie, when a ship's officer turns out to be none other than Alan Ladd! As a side note regarding Billy Gilbert, one of the fun things at the TCM Classic Film Festival was the chance to see him in some color home movies introduced by Gilbert's sister-in-law, actress Fay McKenzie. 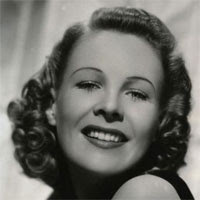 Gilbert was married to Fay's older sister, actress Ella McKenzie, who retired when she married Billy in 1937. Billy and Ella were married until his death in 1971. CROSS-COUNTRY ROMANCE was directed by Frank Woodruff and shot by J. Roy Hunt. CROSS-COUNTRY ROMANCE has not had a release on DVD or VHS. 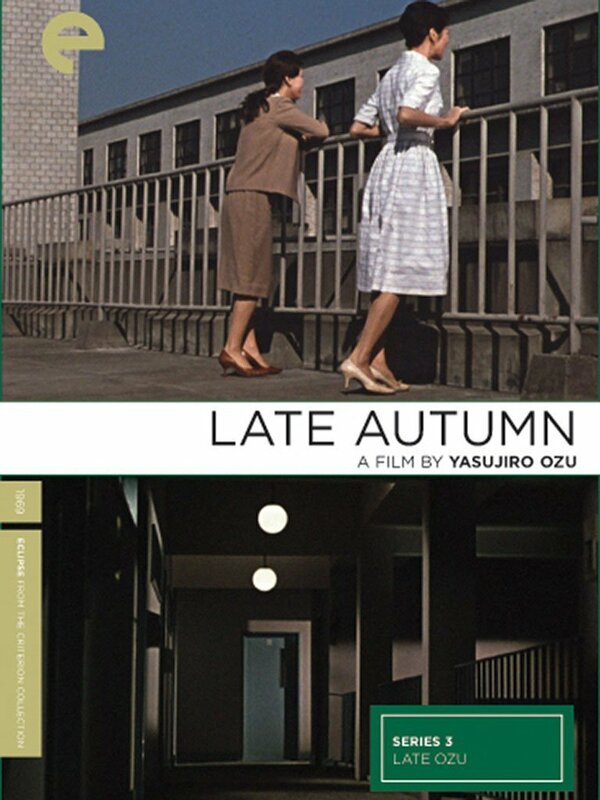 Perhaps at some point it will join LOVE ON A BET and become available from the Warner Archive. In the meantime, this film is shown from time to time on Turner Classic Movies. This year I've been enjoying watching a variety of new-to-me types of movies, from a Japanese drama to George O'Brien "B" Westerns to programmers directed by Lew Landers to the silent films of Harold Lloyd. GIRL SHY (1924) by watching THE KID BROTHER (1927), which proved to be another very special film. Lloyd plays Harold Hickory, the runt of a family which consists of his father, Sheriff Hickory (Walter James) and two huge, obnoxious brothers (Leo Willis and Olin Francis). Harold keeps house for the family and is constantly dismissed by the rest of the family as inadequate. 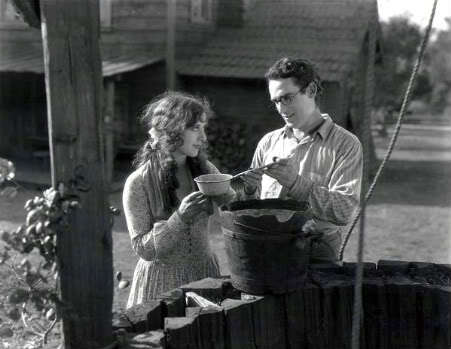 Harold's life changes the minute he meets Mary Powers (Jobyna Ralston), who arrives in Hickoryville with a medicine show. Mary, whose father owned the medicine show but recently passed on, is unhappy and frightened of the leering, oily men who work in the medicine show (Constantine Romanoff and Eddie Boland). Thanks to Mary's encouragement, Harold becomes one determined man when confronting problems; he not only proves to be Mary's knight in shining armor, he saves his father from a crisis. 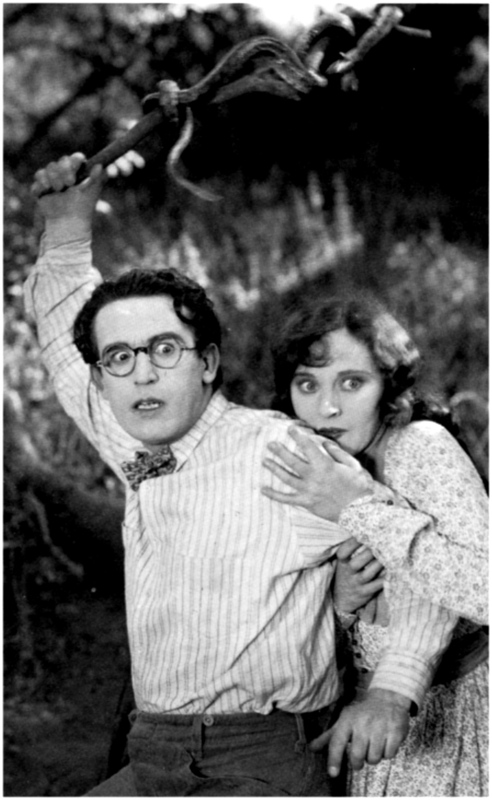 This film reunited Lloyd and Ralston, whom I enjoyed so much in GIRL-SHY; they made several other films together, including THE FRESHMAN (1925) which I hope to see later this year. They have a very special chemistry, and Ralston is simply a magical actress. There's a scene when the medicine show stage has burned down and her tears fall on Harold's hand which made me cry, and I teared up again in the film's final seconds. Ralston is not only a very sensitive actress, she matches Lloyd's comic timing and has some marvelous reactions. That said, the timing and visuals in the film as a whole are quite remarkable. One of my favorite moments was when Harold is confronted by the neighbors' mean dog, and we suddenly see that Harold had planned ahead, producing a cat to distract the dog! The film is packed with such moments which are great fun for the unsuspecting viewer to discover. As someone who's always found the narrative cards in silent films to be an annoyance, as they interrupt the action and remain on the screen too long after I've read them, I continue to be really pleased that the Lloyd films go for very long stretches without using cards, and when the cards do appear they are often quite witty in and of themselves. The Lloyd films have done a lot to encourage my interest in silent films, and if all goes well I'm going to combine a couple of this year's new interests by seeing George O'Brien in the "silent to sound" transition-era film NOAH'S ARK (1927) at UCLA tomorrow night. THE KID BROTHER runs 82 minutes, It was directed by Ted Wilde and J.A. Howe, with IMDb also noting uncredited directing contributions by Lewis Milestone and Harold Lloyd. The cinematographer was Walter Lundin. 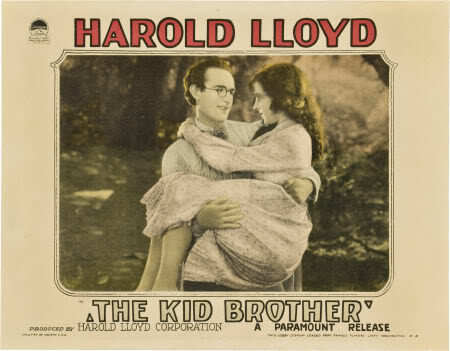 THE KID BROTHER is available on DVD from New Line Cinema in The Harold Lloyd Comedy Collection, Vol. 2. It has a beautiful musical score composed by Carl Davis. Extras include a commentary track. THE KID BROTHER was recently shown on Turner Classic Movies, so perhaps it will turn up there again in the future. 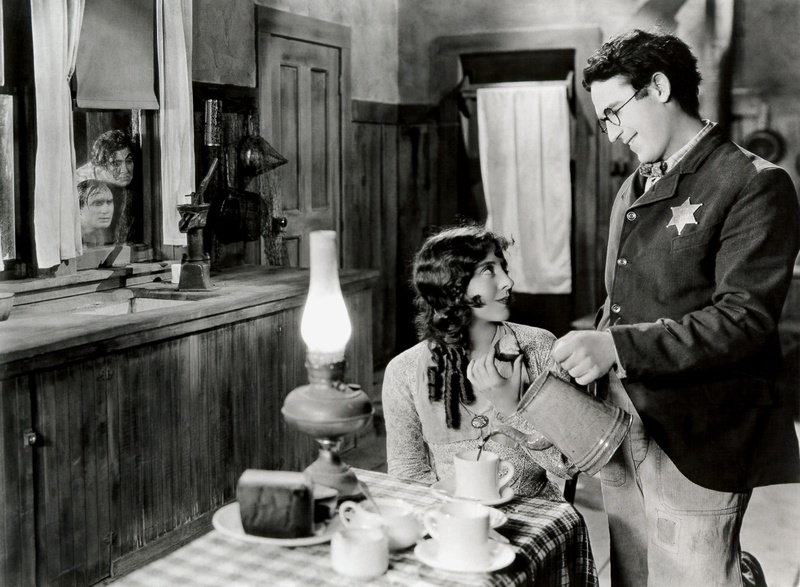 For more on this movie, Will wrote about it last year at Cinematically Insane, and here's a short photo tribute to wonderful Jobyna Ralston. GUNS OF HATE is a solid Tim Holt Western, evocatively filmed in the Alabama Hills outside Lone Pine, California. The plot is pretty standard-issue stuff. Bob Banning (Holt) and his pal Chito Rafferty (Richard Martin) befriend Ben (Jason Robards Sr.), who's found the Lost Dutchman mine. Ben is soon murdered for the map to the mine, and Ben's niece Judy (Nan Leslie) thinks Bob and Chito did the deed. 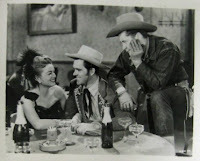 Bob and Chito have to clear their names in a hurry, and they're aided by saloon gal Dixie (Myrna Dell), who's in love with Chito. For me there's nothing quite like a Tim Holt Western at the end of a long day. The plot really isn't all that important, it's simply the fun of spending time with the congenial Holt and Martin in the great outdoors. I love turning on a movie like GUNS OF HATE and immediately being transported to Lone Pine, beautifully filmed here by George E. Diskant. The Alabama Hills and Mt. Whitney never looked better. These movies have a way of making the viewer feel as though you're right there next to the camera as you watch. In fact, it looks like it might have been cold when this one was made; the wind is whipping pretty good in the final scenes, and the snow on the ground seems as though it might be the real thing. It's worth noting that Diskant would later film the stunning, snowy vistas of ON DANGEROUS GROUND (1952). The supporting cast includes Steve Brodie, Tony Barrett, and James Nolan. This 61-minute film was directed by Lesley Selander. GUNS OF HATE is available in a gorgeous print in the Tim Holt Western Classics Collection, Vol. 2. It may also turn up on Turner Classic Movies. Previous reviews of Tim Holt Westerns: THE RENEGADE RANGER (1938), THUNDER MOUNTAIN (1947), RIDERS OF THE RANGE (1950), STORM OVER WYOMING (1950), RIDER FROM TUCSON (1950), and BORDER TREASURE (1950). 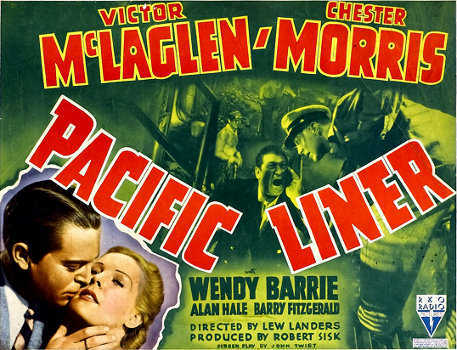 PACIFIC LINER is another one of a number of films starring Chester Morris and directed by Lew Landers. 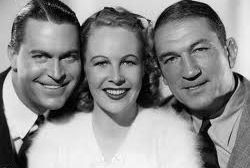 Unfortunately a potentially interesting story is done in by the film's overreliance on Victor McLaglen, who gives a loud, blustery performance. The movie starts out well enough, with the opening credits playing backed by Robert Russell Bennett's Oscar-nominated score. (The music isn't very noticeable after the credits, and the score quite rightly lost to what I think might be the greatest film score of all time, Erich Wolfgang Korngold's THE ADVENTURES OF ROBIN HOOD.) There's a nice sequence of the title ship departing Shanghai, but after that the movie settles into dullsville. Morris plays a ship's doctor, with Wendy Barrie as the nurse who loves him. They find themselves battling a cholera epidemic among the crew, as one by one the firemen who keep the engines running succumb to the disease. 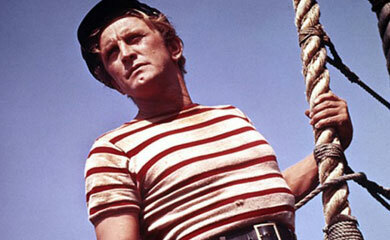 McLaglen is the ship's autocratic Chief Engineer. 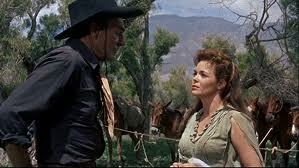 Unfortunately McLaglen has much more screen time than Morris or Barrie, and he wears out his welcome quickly. I can tolerate McLaglen in small doses in supporting roles in John Ford films such as SHE WORE A YELLOW RIBBON (1949) or THE QUIET MAN (1952), but when it's all McLaglen, all the time, not so much. 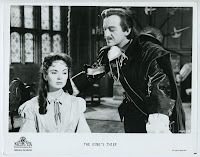 I also had trouble with the storyline which has him vying with Morris for Barrie's attentions; Barrie never takes him seriously, but the idea is pretty silly to begin with, not least as McLaglen was a quarter century older than Barrie. That same year Morris and Barrie would costar in the very fine, spooky "B" thriller FIVE CAME BACK (1939), directed by John Farrow. 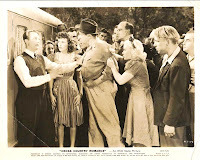 Unfortunately for Morris, he also appeared with another abrasive actor, Wallace Beery, in 1939's THUNDER AFLOAT. I'll never get the casting of McLaglen or Beery in leading roles, but apparently at the time they were popular enough! McLaglen's crew includes Alan Hale (Sr.), Barry Fitzgerald, Allan "Rocky" Lane, and Paul Guilfoyle. Halliwell Hobbes is the captain. This 76-minute movie was filmed by Nicholas Musuraca. There's a fair-minded review of this film posted at Apocalypse Later. Films directed by Lew Landers which have previously been reviewed at this site: NIGHT WAITRESS (1936), WITHOUT ORDERS (1936), FLIGHT FROM GLORY (1937), THEY WANTED TO MARRY (1937), THE MAN WHO FOUND HIMSELF (1937), DANGER PATROL (1937), BORDER CAFE (1937), DOUBLE DANGER (1938), CRASHING HOLLYWOOD (1938), SKY GIANT (1938), SMASHING THE RACKETS (1938), TWELVE CROWDED HOURS (1939), CONSPIRACY (1939), STAND BY ALL NETWORKS (1942), ALIAS BOSTON BLACKIE (1942), AFTER MIDNIGHT WITH BOSTON BLACKIE (1943), THUNDER MOUNTAIN (1947), DAVY CROCKETT, INDIAN SCOUT (1950), and MAN IN THE DARK (1952).